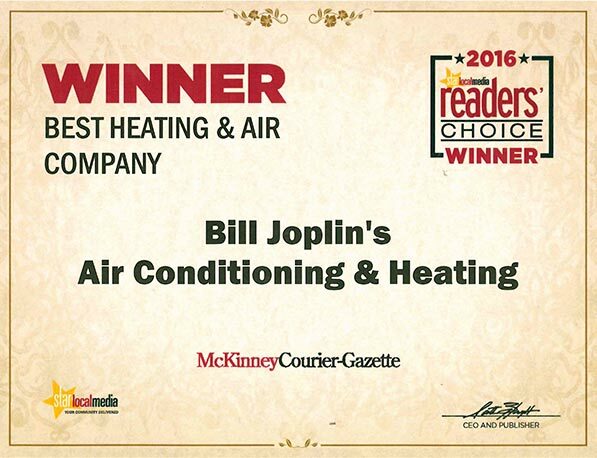 At Bill Joplin’s Air Conditioning & Heating, we know that our customers depend on great heating equipment to stay comfortable throughout the year. Even in Collin County’s warm climate, winter chills can be dangerous, and a good furnace or heat pump can make all the difference. As a full-service heating contractor, we offer installation, maintenance and repair of all makes and models. See our heating specials! As a Carrier® Factory Authorized Dealer, we have the brand knowledge and technical expertise needed to set up a new heating system in any home. We make sure our staff stay abreast of the latest developments in the heating industry, and we never hesitate to recommend the most efficient and effective equipment available. We talk with our customers to determine their specific needs and evaluate their system to decide what we need to improve in order to meet those needs. What are the efficiency ratings for a furnace? What is my heating footprint? Heat pumps and furnaces all need routine maintenance to keep running reliably and efficiently throughout the heating season. We know our neighbors depend on their heating equipment, which is why we offer dependable maintenance services to maximize heating effectiveness. Our heating contractors conduct full inspections to catch any small issues before they become large ones. We thoroughly clean every furnace to keep the air flow going, make calibration adjustments needed to maximize energy efficiency and extend the lifespan of each machine. We also offer annual service agreements to keep these appliances in good working order year after year. Since heating failures can be extremely frustrating and potentially dangerous, we at Bill Joplin’s Air Conditioning and Heating offer prompt, professional heating repair services throughout Collin County. Our NATE-certified technicians are trained and qualified to repair all makes and models of heating equipment, and we have decades of experience dealing with common and uncommon problems alike. We arrive at every repair visit on time and equipped with all of the parts and equipment needed to finish the majority of jobs on the same day. Because failures can happen at anytime, someone is always available for 24/7 emergency heating repair services. To schedule an appointment for Heating Repair, Replacement & Maintenance, fill in the information below. Someone from Joplin’s will contact you shortly.